Accessories: Accompanied by Patek Philippe Extract from the Archives confirming production of the present watch in 1974 and its subsequent sale on June 28, 1974. 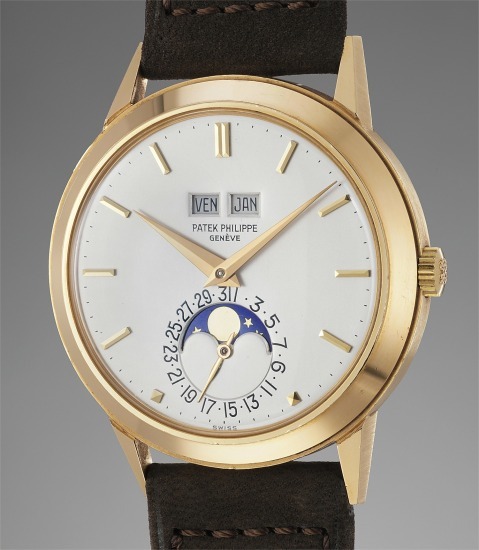 Reference 3448 is a landmark model in the history of Patek Philippe. Technically, the reference represents the first example of automatic perpetual calendar made by the company; aesthetically, it incorporates design elements absolutely typical of the 1960s and 1970s. Historically, it is remarkable as one of the very few complicated models which Patek Philippe kept producing even during the quartz crisis of the 1970s: it was in fact made from 1961 to 1981, when it was retired in favor of its sibling ref. 3450 (very similar, with some minor differences in the case construction, and with the leap year indication). The movement is based on what is universally recognized as one of the greatest - if not the greatest - automatic movement ever designed: cal. 27-460 (which is the final evolution of historical cal. 12-600AT), upgraded of course with a perpetual movement to become cal. 27-460Q (Q for Quantième: perpetual). The design is defined by a very futuristic case architecture and an extremely clean dial, without virtually any kind of graphic addition save for the minute divisions and the signature. Fully incorporating design elements typical of the time, it is defined by sharp, angular shapes - a completely different approach to case architecture than the smooth curves found on other historical pieces such as reference 2499 and 1518. Four series are known for the reference: early examples feature small calendar ring, indexes closer to the center of the dial and engraved/enameled minute divisions; the second series introduces beady minute divisions; the third series maintains the beady divisions but introduces the large numerals for the date rings and indexes closer to the outer edge of the dial, and finally the fourth series - exemplified by the present timepiece - features printed minute divisions. Offered for the first time on the public market, the present timepiece impresses with its remarkable honest and well-preserved condition and is without a doubt a compendium of technical proficiency and design mastery.